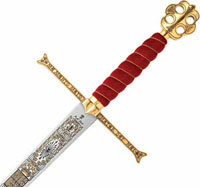 Marto Catholic King Swords for sale are 48 inches in all. These swords are inspired by the real 15th century sword that was used by Ferdinand II the Catholic to knight Christopher Columbus. The mirror polished 36 inch tempered blade is display ready featuring an unsharpened factory edge. The stainless steel blade features elaborate 24kt gold etchings. The cross guard, scalloped pommel and fittings are made of sculpted cast metal with real 24kt gold plating. The handle features burgundy colored velvet with a wire wrap. The guard features an inscription referring to the motto of joint equality between Ferdinand II and Isabella. 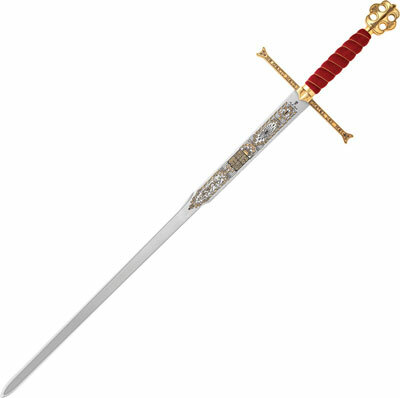 Buy these Marto Catholic King Swords for $429.99.